There are limited opportunities to take the train in Nova Scotia. 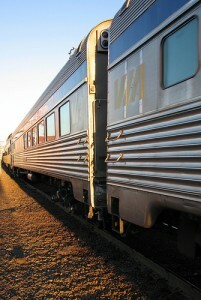 VIA Rail is the only public operator, with a daily service that stops at Halifax, Truro, Springhill and Amherst. One train a day runs in each direction. From Halifax, The Ocean train leaves at 12:35pm, bound for points in Nova Scotia, New Brunswick and Quebec. Going in the other direction, the train departs Amherst at 13:02pm, heading to Halifax. With such a restricted service, you might wonder if it’s worth taking the train at all. There’s no doubt that rail travel is relaxing, with more space to stretch your legs than on a bus. There’s also a restaurant car on VIA trains. If you can make the schedule fit, the train is a good choice. Otherwise, take the bus.